Tsukuba International School is a member of Scholastic, a mail order club that is very popular with schools in North America. It is the world’s largest publisher and distributor of children’s books and a leader in educational technology and children’s media. While its primary focus is children’s books, it also offers magazines, technology-based products, teacher materials, television programming, film, videos, and toys. 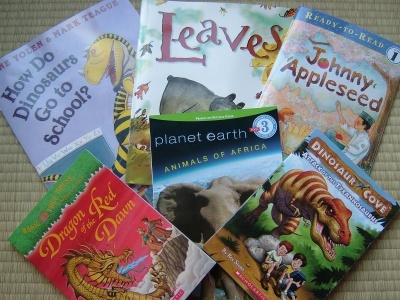 Students at our school are given the opportunity of ordering books from Scholastic on a regular basis. Our September order recently came in and the kids were SO excited to receive not just their own books, but some extra books for our school library. Here is a scene from our morning meeting. One of our students is sharing a new book with her schoolmates. And here are some of the new books that we have added to our school library. It is great to see the kids so excited about books! If you are interested in learning more about our school library, please have a look at the Library page on our website where you can see a random sampling of our collection and even search for books online. We only have a very small portion of our books online right now, but we will keep working on getting our full collection online over the school year.